What does dark matter mean? Dark matter is speculated to be a type of matter that cannot be directly observed. It has an unknown nature, a high mass, and astronomers hypothesize that it makes up much of the universe. Where does dark matter come from? In the late 19th century, astronomers noticed dark regions in otherwise dense clusters of stars. In 1904, in an effort to address the problem, Lord Kelvin found that the estimated mass of the Milky Way Galaxy was less than its observable mass, and attributed the difference to stars that were so-called “dark bodies.” Answering Kelvin in 1906, French physicist Henri Poincaré argued there wasn’t any special “matière obscure,” translated as and the first known use of dark matter as such, but rather undetected, non-light-emitting stars. 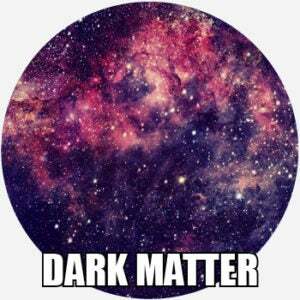 The term dark matter was in use by scientists as an English term by 1922. As astronomy and astrophysics progressed throughout the 20th century, inconsistencies about the way the universe was assumed to work began to add up. For instance, stars in the outer regions of spiral galaxies moved faster than they should, which suggested these galaxies had far more mass than scientists had accounted for. Astronomers Vera Rubin and Kent Ford, working on this problem, suggested this might be accounted for by dark matter. Throughout the 1980s and 1990s, the existence of dark matter, sometimes characterized as cold and slow-moving, was gradually accepted by many scientists as other pieces of evidence began to build up. But the story of dark matter is far from over. Scientists don’t exactly know what it consists of, even if it really exists in the form that the term implies, and how to even define it in the first place, making it one of the top, unsolved problems in physics. They do know, however, that dark matter is not galaxy-sized black holes, because we’d be able to detect the light from gravitational lensing (bending of light from a more distant source), and that it’s not antimatter, as antimatter makes tiny explosions upon contact with matter. Nor is it made of dark clouds of normal matter, called baryonic matter, because that would absorb radiation and could be detected. Some theories suggest a link between dark matter and smaller black holes, dense bodies like brown dwarf stars, extra dimensions, or parallel worlds. Others suggest that it’s just a type of weakly-interacting particle that we can’t detect yet, while still others have proposed a new theory of gravity to account for the issues dark matter suggests. Dark matter is now such a well-known term in the sciences that it has come to be used in reference to other things that are unobservable or not completely understood.